I have a mild obsession with vintage tins right now. This led me to get up early Sunday morning and bike (in January!) over to the St. Lawrence Antique Market. I met up with Dominic and we looked for treasure. True to my mission, I scooped up a bunch of tins. Afterward, we stopped into Petite Thuet for a quick bite. 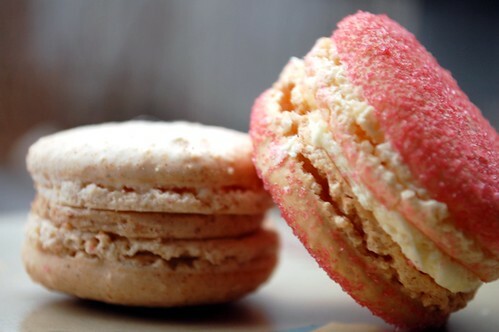 I had a wonderful flaky pastry with sliced apples and couldn’t resist taking home a couple of their macarons. I especially loved the cinnamon flavour! I don’t actually like rosewater, but it was so pretty and pink that I had to get it too. I’m happy to say it was really delicious. The macarons in this photo are actually sitting on top of one of the tins I got, but you’d never know it. I guess I owe you some vintage tin photos! yes, definitely show us your lovely tins! I too can’t help myself when I come across vintage tins. I’m curious to hear/see how you put them to use. yeah, petit thuet! thuet’s story amazes me, ever since i saw him on “opening soon”. must give these flavors a try. how pretty! but, ick, rosewater. I was so sad when I realized that turkish delight is usually flavored with rosewater. I always thought that Narnia had better treats. . .